In the South of Scotland League Creetown ran riot in their match against bottom placed Dumfries YMCA when they won 8-1. Creetown led the contest at the half way stage through goals from Ben Herries and Micky Sutherland and piled on the pressure after the break with Sutherland scoring a further three goals to add to a brace from Ross Landers and single from Dean Fyfe. Newton Stewart recorded a good victory over Abbey Vale at Blairmount by winning 4-1. The first half hour was fairly even but a goal in the 37th minute from striker Robert Middleton followed five minutes later by a strike from midfielder Robbie Thomson gave the home side a comfortable lead at the break. In the second half Newton continued to press their visitors and Middleton found his side’s third goal and ten minutes from time Thomson completed his double for goal number four. Although Vale scored from a late goalmouth scramble the three points were safe for the home side as they maintain a good run of form. Wigtown and Bladnoch are now ten points clear at the top of the league table following a 4-1 victory over Upper Annandale at Trammondford Park with St Cuthbert Wanderers in second place on 39 points and Edusport Academy a further point behind in third place although both have a game in hand to the leaders. Goals from Jay McInally and Luke Hammond were enough for Threave Rovers to see off the challenge of Lochmaben at Meadow Park although the visitors did manage to find the net late on to keep the scoreline close. 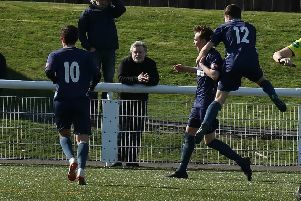 Saturday saw Heston Rovers and St Cuthbert Wanderers progress to the final of this season’s Cree Lodge Cup by seeing off the challenge of Mid-Annandale and Edusport Academy respectively. Saints beat Edu 5-2 at St Marys Park while Mid-Annandale and Heston Rovers served up a five goal thriller at Lockerbie. All the goals for Mids and Heston came in the first half of the match with the visitors Ryan Adamson scoring a hat-trick with Jamie Struthers adding a single. Dean Smith scored from the penalty spot for what proved to be a consolation goal for Mids and although there were chances for both sides in the second forty five minutes there were no more goals and Heston are now lined up to play Saints in the final of this particular competition. Both teams finished the match with ten men with Cammy Thorburn and Robson Halliday both seeing red. Following the match Mid management duo of Stewart Murray and Dougie White resigned their posts and consequently the Lockerbie side have appealed that interested parties contact Secretary George Trudt but in the interim Peter Crolla wil be in charge for this Saturdays match against Threave Rovers. The first Final of the new Alba Cup competition took place last Friday evening at Palmerston Park when Lochar Thistle beat Nithsdale Wanderers 4-0.